Shopping for everyday clothes is hard enough: even within a certain brand, it’s possible to fit a wide range of sizes. But when it comes to shopping for a wedding dress, finding the perfect fit can feel even more elusive. If you shop in person at a full-service boutique, you’ll have the benefit of having professional consultants fit and make alterations. But many bridal shops also offer the option to purchase a gown online–and that’s when it’s crucial you understand how to measure yourself. Here’s your no-fuss guide to measuring yourself to make sure that your gown requires as little additional alterations as possible. Determining the right size: Most bridal boutiques that allow online purchases also provide a size chart, which is a general size guide based on your personal measurements. It’s important to consult these charts and not assume a size. What to wear: If possible, you should wear undergarments you’d wear with your dress, or similar. Make sure when you take measurements that your feet and legs are together, and you are standing tall and straight. Bust Size: A common misconception is that your bust size is equal to your breast size. The bust actually is a few inches different than your normal band size. 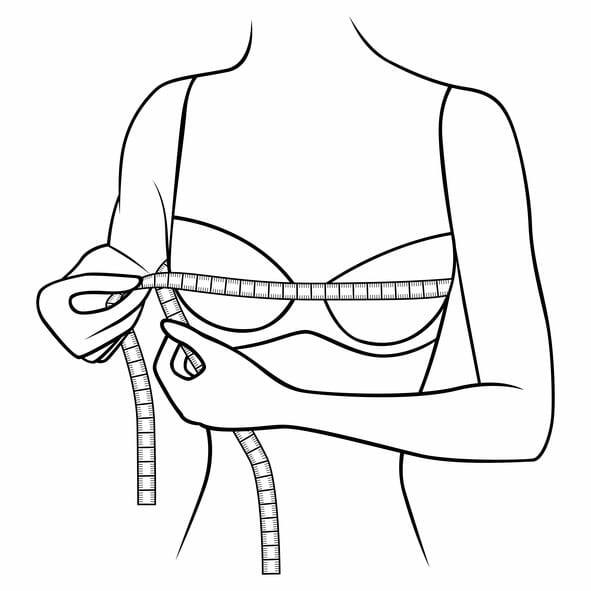 To measure bust size, take measuring tape around the fullest section of your chest. Make sure it’s level around the back. Waist Size: You’ll want to make sure you measure your natural waist, which lies on the narrowest point between your pelvis and the bottom of your rib cage. Cloth tape measures are most suited for an accurate measurement. Hip Size: You’ll want to measure the entire circumference of your hips. Begin at one hip, wrap around the buttocks, and to the other hip. The tape measure should be completely flat. Hollow to Hem: If you aren’t sure what measuring this entails, you wouldn’t be alone, but it’s a very important part of measuring yourself. This is the main measurement for determining the appropriate dress length. Start at the top of your neckline (center of your collarbone) to where you want the hem to be. The measuring tape should not hit the floor. Other tips: When in doubt, measure again! Measuring yourself can be challenging, so even consider enlisting some help. The good news is that even if you don’t get your measurements one hundred percent correct, there’s always an option to take the dress in somewhere for alterations.